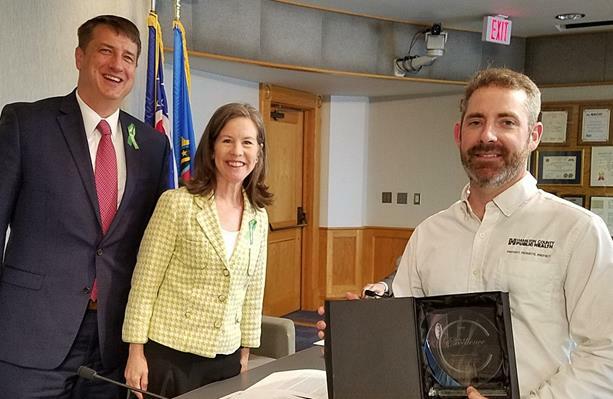 Hamilton County, OH……Hamilton County Public Health Environmental Health Supervisor Tucker Stone received the Hamilton County “Circle of Excellence” award for outstanding service at a ceremony today at the Hamilton County Board of County Commissioners meeting. Stone was recognized for his work in going the extra mile to aid citizens with hoarding issues. Rather than simply bringing enforcement action, Stone works with citizens, especially seniors, to access services to obtain help. He is an integral member of Hamilton County’s Hoarding Task Force. In one particular incident, a senior had his home condemned for unsanitary conditions as a result of hoarding and had no transportation or local family to call on. Stone transported the senior to a hospital. There, he helped him check in for evaluation while simultaneously working with hospital social workers to locate relatives. “Tucker exemplifies our agency mantra of education over enforcement,” says Hamilton County Health Commissioner Tim Ingram. “He is a driven, compassionate professional and is most deserving of this recognition. L-R, Hamilton County Commissioners Chris Monzel and Denise Driehaus, present the Circle of Excellence Award – Outstanding Service to Hamilton County Public Health Environmental Health Supervisor Tucker Stone.